The common fig ( Ficus carica L.), family Moraceae, is the only member in the genus cultivated for its fruits. For the past several decades, severe genetic erosion has threatened fig germplasm. Therefore, several fig collections were established in Asia, Europe, North America and North Africa. Fig cultivars are usually characterized using traditional methods based on phenotypic characters. However, molecular identification of fig cultivars has been carried out using random amplified polymorphic DNA (RAPD), inter simple sequence repeat (ISSR) and single sequence repeats (SSR) molecular markers. Marker-assisted selection is used to identify a character of interest such as yield, fruit quality, biotic and abiotic stress resistance. Induced mutations are desirable in fig improvement for important fruit characters such as small ostiole size, large fruit size and fruit flesh quality. Fig mosaic disease (FMD) is one of the major diseases of fig found throughout the world. 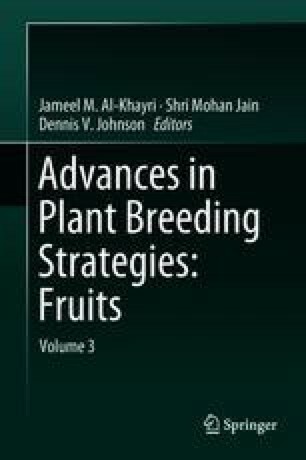 Different fig improvement breeding methods are described in this chapter including conventional breeding and biotechnology approaches. I acknowledge my colleagues, especially A. Essid, S. Nahdi, T. Triki, B. Lachiheb, L. Ben Yahia, M. Lahzein, K. M’saddak, A. M’saddak and A. Warda, in the Arid Land and Oasis Cropping Laboratory. As well, I gratefully acknowledge my colleagues B. Ben Salem and M. Ettir, who work in the germplasm collection (El Gordhab) of the Institute of Arid Regions of Medenine, Tunisia.